One of the best things about becoming a vegan has been this wonderful new passion for food and cooking. I have experimented with styles of cooking and ingredients that I would never have even thought of last year! This past weekend, I bought a big bunch of red chard at the Farmer’s Market on a whim – I have never cooked with or even tasted chard, but I couldn’t resist it’s green leafiness! After consulting with the wonderful FB community that is Power to the Veg! I decided that sauteing the chard was the way to go. I tossed some onion and garlic in the pan with just a tiny bit of oil; the chick peas went in next (I used canned), followed by the chard. It smelled AMAZING while it was cooking – I couldn’t wait to start eating! Even though it could have been eaten on its own, I put all of the items over brown rice and VOILA! My first chard creation! 1. Start your rice – I used a rice cooker but you can always cook yours on the stove. Usually I use just less than a 1:2 ratio of rice to water. When I use that exact ratio in the rice cooker, it comes out a bit mushy. 2. Heat a very small amount of olive oil in your pan over medium heat – if you would like to cut out the oil, you can saute using water. 3. Add garlic and onions to the pan. Once the onions start to become translucent, add the chickpeas. Since these are already cooked, they just need to be warmed through, about 3-4 minutes. 4. Add the red chard to the pan, stirring so that it mixes with the onions and chickpeas. Cook until tender, about 5-6, stirring occasionally. 5. If you’ve timed it correctly (rice takes about 20-25 minutes), you can spoon the veggie mixture over the brown rice and enjoy! The finished project over brown rice! It’s as simple as that! I think red pepper flakes would be a great addition if you like your food with a kick. 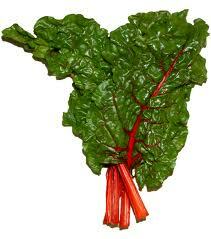 Some of the FB veggies suggested juicing the chard as well, so that will be an upcoming adventure! 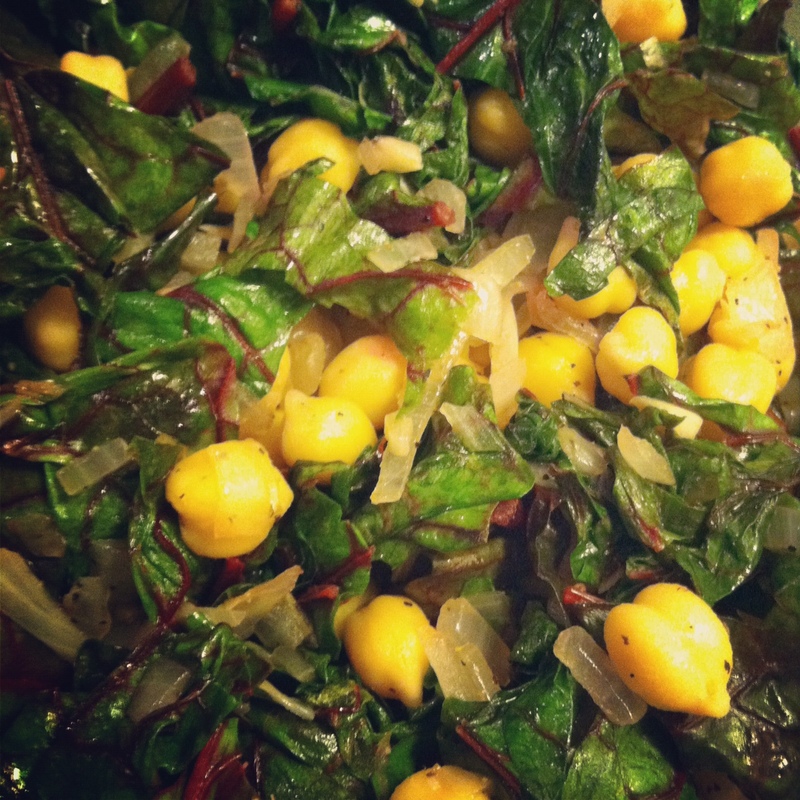 Chard, with all of its colors, will definitely be making a repeat appearance in my dinner line-up! 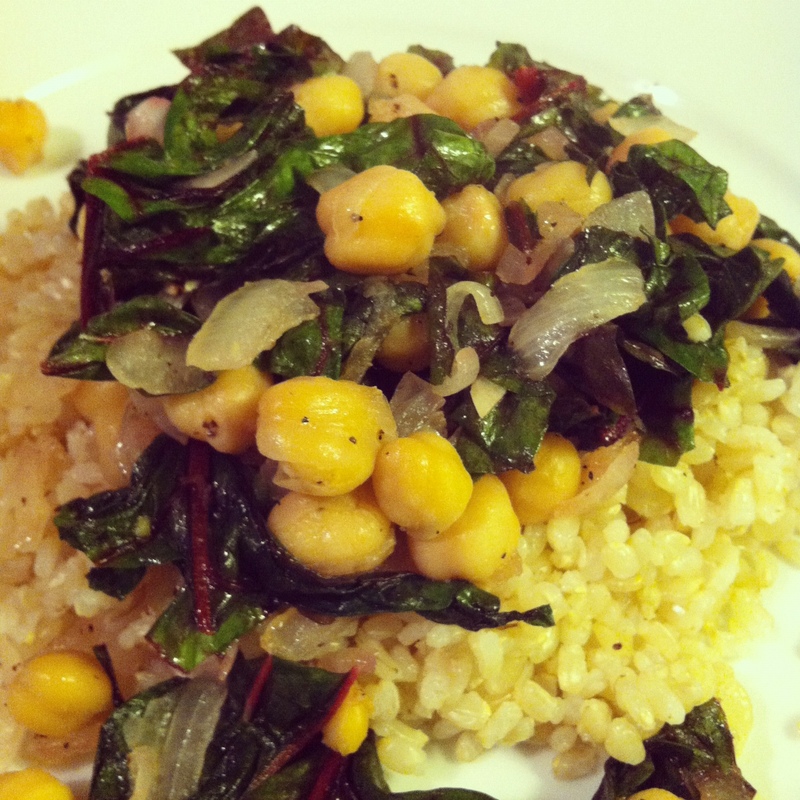 What are some of your favorite chard recipes? I would love to hear about them in the comments below!